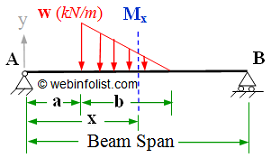 This calculator provides the result for bending moment and shear force at a distance "x" from the left support of a simply supported beam subjected to moment at supports. 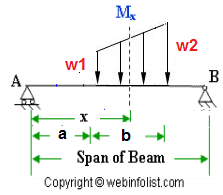 It also calculates support reactions and maximum bending moment value as well as its location. Please refer to the figure and enter the values of moments and distances in the form given below and then press "Calculate". Enter the clockwise moment as negative and anti-clockwise as positive. This calculator can also be used if there is moment at only one support by putting the other moment equal to zero in the input form. 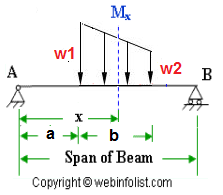 All the distances should be measured with reference to the extreme left end of the beam. 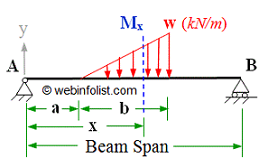 You can visit instructions for bending moment calculator if you need more help.